JACKSONVILLE, Fla. - The Florida agency that oversees the welfare of children in our state confirms to the I-TEAM that 31 of its employees have lost or are losing their jobs as a result of an investigation into possible fraud. The Department of Children and Families says more than 1,300 of its own employees applied for Disaster Supplemental Nutrition Assistance Program (D-SNAP) benefits last fall after Hurricane Irma. The agency conducted an automatic audit of all of those applications and identified applicants who submitted inconsistent information. Those applications were turned over to DCF's Office of Inspector General for further investigation. News4Jax extensively covered days of area residents standing in long lines to fill out paperwork and apply for these benefits following Hurricane Irma. By late October, more than $1.2 billion in D-SNAP benefits were paid to 7.2 million Floridians. In order to obtain these special benefits from the federal government, an individual living in a disaster area would have to show he/she suffered a loss of income due to the disaster, did not have access to resources, and had incurred disaster expenses. "I was very disappointed in what I heard," State Sen. Audrey Gibson told the I-TEAM, after hearing about the DSNAP investigation. Gibson explained she had been at a Jacksonville DSNAP application site, overseeing the process, adding the application process needs to be reviewed. Gibson said there are two victims to this type of fraud: the Florida taxpayer, and hurricane victims. "If someone knew they were not eligible and that they should not be partaking in something for people that are suffering, then I do take issue with that," the state senator said. The Department of Children and Families takes the responsibility to be good stewards of taxpayer money very seriously and investigates all instances of potential fraud. DCF has no tolerance for any actions that undermine the public trust and terminates employees found to have fraudulently obtained DSNAP benefits. 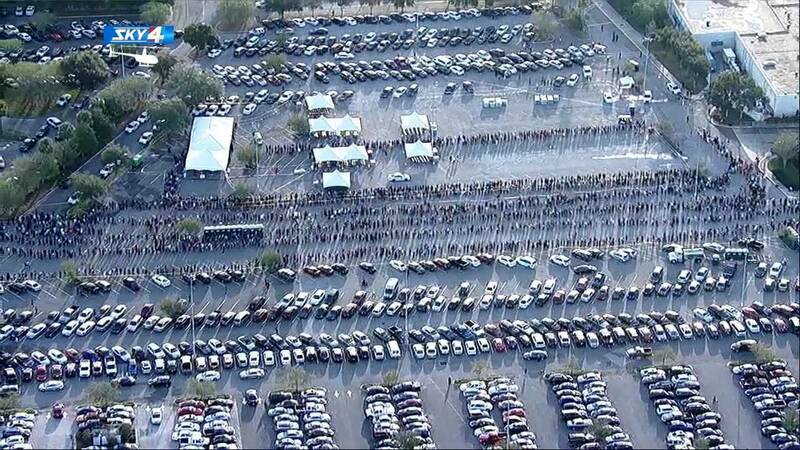 Food for Florida was the largest DSNAP activation in United States history processing more than 1.2 million applications. DCF stationed Public Benefits Integrity (PBI) fraud investigators at all 50 DSNAP sites and prevented more than $14 million in fraudulent applications. In addition to on-site prevention, DCF reviewed a sample of all completed applications, which included all 1,300 applications submitted by DCF employees. Any cases involving employees that were identified to be potentially fraudulent were referred to PBI and DCF’s Inspector General’s Office for a joint investigation. The department will continue to work with law enforcement agencies, across the state, to hold anyone who illegally obtained benefits accountable for their actions. The I-TEAM is told individuals found guilty of submitting false information on their application for D-SNAP benefits are subject to criminal prosecution. If found guilty of fraud, the person will be required to pay the money back. If they fail to do so, lottery winnings, tax returns and other revenue sources can be intercepted. "The shame is, there's only a finite amount of money that the state of Florida has and the government has, to help people," said attorney Gene Nichols, who is not associated with the investigation. "And to have people stealing food stamps, it's pure theft, it's theft from the government, and it's clear they are going to be prosecuted." Nichols said this is concerning because disaster fraud is rampant, and pointed out that EBT cards have been sold in the past on the black market. "We have seen people put them on the internet and get them prosecuted for wire fraud for trying to sell these on the internet," Nichols said. "While the state is announcing their investigation, they could be facing statewide prosecution as well as federal prosecution." DCF told the I-TEAM that the 31 individuals who were terminated "do not meet the high standards we hold more than 12,000 employees to." Households that were found to be eligible for D-SNAP benefits received the assistance for two months, with a maximum allotment, based on eligibility, of approximately $1,100.